My father took my brother and I camping at Mount Palomar a few times when I was a kid. We would fish at Doane Pond (back then it seemed like a lake but now I realize its little more than a puddle), and always visit the Palomar Observatory just up the road. I was fascinated by the amazing astronomy photographs in the gift shop, and the sheer size of the dome and telescope (200″ diameter, 14-ton glass mirror!) seemed awesome. Fast forward 40 years. I was recently permitted to photograph this telescope at night. 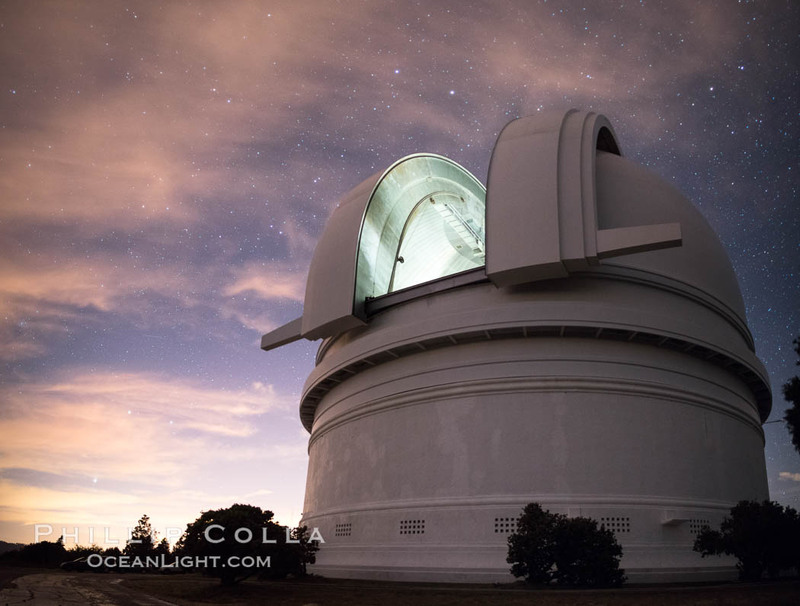 The Palomar Observatory, which first collected light in 1948 and is part of the California Institute of Technology, remains one of the most important telescopes in the world. The evening I photographed the observatory, I was fortunate to be accompanied by the observatory’s public relations officer who kindly answered my many questions. One remark of his in particular really stunned me regarding the work that was being done the very evening I was there. I still sort of shake my head thinking about it. I spent years in college and grad school studying some heavy mathematics and science and still have trouble wrapping my mind around this idea: within the last decade and particularly in the last year, scientists at the Palomar Observatory have made direct observations of exoplanets — planets orbiting another star. I don’t mean inferences of other planets by observing the slight periodic dimming of a star, suggesting a planet is crossing in front of the star. I mean direct observations of the exoplanets themselves, through spectroscopy, which allows the composition of the planet to be understood. The distances involved in this science are so great, and the implications so profound, that I find it a little disorienting to ponder for more than a few minutes at a time, my puny intellect is overwhelmed! I’ll have more images of Palomar Observatory to share in the coming weeks. Cheers and thanks for looking!